Ummm…huh? Somebody out there has my math skills. Yikes, very sad. 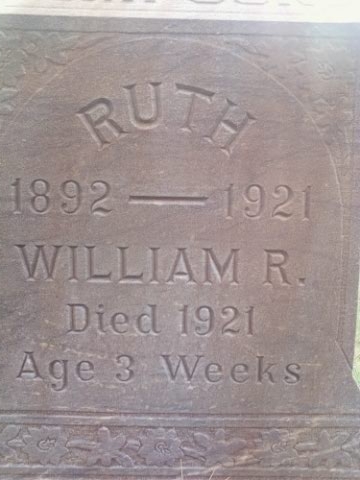 So Ruth and baby William died and were buried together. Disease? or Childbirth related? Are they relatives of yours Nap? These two lie in a cemetery right near us where I’d walk and look for names for Butter before he was born. I’m guessing she died in childbirth and he died three weeks later, of illness or malnutrition. Just thinking about how far we’ve come, how far we haven’t come, and how lucky we are. In general. Because we’re not the poor man who had to put in the order for this headstone. @subWOW, I know. It’s like the Hemingway six word story. jc – you are so smart. I was questioning my math skills, too, Kitch – so you’re not alone! Ok, I get it now! Crazy, I couldn’t imagine. These things make me sob. And thinking of who they left behind…hard. Nap, we should be thankful for the advances that medicine has brought us, and yet, there are times when it still fails. Poor man who lost so much and had to order the headstone, to be confronted with that reality.